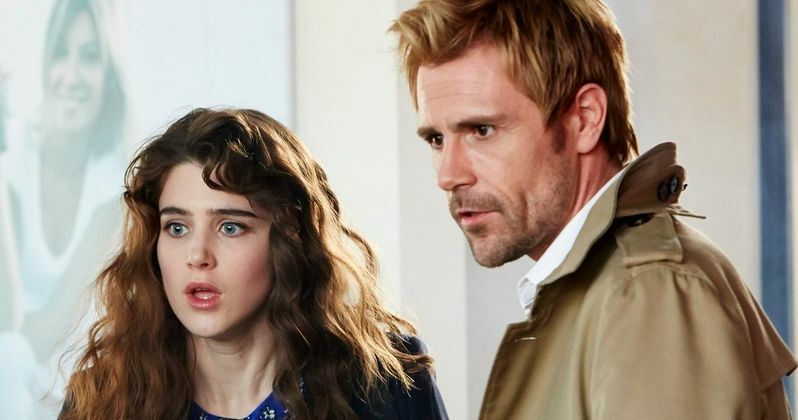 We haven't heard much about NBC's Constantine since the network released the first trailer last month, but it is shaping up to be one of this fall's most anticipated new shows. Matt Ryan plays the title character, John Constantine, a demon hunter and occult master, who joins forces with Liv (Lucy Griffiths), who has the ability to see into other worlds and predict supernatural occurrences. Matt Ryan and Lucy Griffiths recently shared new details about the series in a recent interview, with the actors revealing that the series is trying to stay as close as possible to the DC/Vertigo comic book, how Liv really feels about John, working with pilot director Neil Marshall and more. The Hellblazer comic book series depicted John Constantine as a blonde British man, which wasn't exactly what the fans got in the 2005 theatrical adaptation Constantine. Matt Ryan spoke about the breadth of material the show can draw from in the comics, while revealing the show has elements of sarcastic humor and dark and gritty drama. "I think as with the source material, there's so much to draw from in terms of the character and the balance of humor and wit and dark and gritty. It's great, because John has this kind of real sarcastic, ironic British wit. It's funny, but at the same time it's serious and dark and gritty. It's got it all, I think." Lucy Griffiths said there is a love/hate relationship that Liv has with John in the series. "Like how all women like to feel about men, she loves him and she hates him. She thinks he's an absolute idiot, and she just finds him annoying. At the same time, she can't deny that he's a genius, and she's thrilled by what he has to offer her in terms of excitement. He's irresistible to her from that point of view. She helps him. She's his psychic sidekick." Matt Ryan also added that John seeks out Liv's help because of a message he received from "beyond the grave" that Liv is in trouble, when he discovers her abilities. "she actually has an ability, and John seeks her out because he's got a message from beyond the grave, from an old friend of his, whose daughter is in trouble. That's Lucy's character Liv. Then John goes about saving her and at the same time discovers that she has this ability. So then he kind of uses that ability and slightly manipulates her, but they need each other, and they set about trying to rid the world of all the evil." The Hellblazer comics ran for over 300 issues, with Matt Ryan adding that he has read 100 of them so far, and that the production's goal is to stay as faithful to the comics as possible. "Yeah, and we're trying to stay as close to the source material as possible and really do the comics justice. So, hopefully, we can do that." The Pilot episode, airing Friday, October 24 after Grimm, was directed by Neil Marshall, who is best known for films such as The Descent, Doomsday and Centurion, along with his work on HBO's Game of Thrones. Lucy Griffiths revealed that she was comforted by the fact that the director was British. "I was just so comforted by the fact that he was English -- which sounds silly, but when you're used to working away from home -- but that was an instant comfort; that's the only way I can really explain it." Matt Ryan added that he was a fan of his previous films, and that he had the right vision to capture the tone of the show. "I thought he was great. I've been a fan of his for awhile as well. The Descent, Dog Soldiers, those films, I've loved for years, and the tones of those. As soon as I knew that he was part of the team, I was thrilled. For this kind of thing, you really do need someone with that vision to get that kind of tone right." With Gotham debuting on Fox this fall and Arrow returning for its third season on The CW, Constantine finds itself among several DC Comics properties on the small screen. When asked about the competition, Matt Ryan had this to say. "I think it's the new golden age of comic books, isn't it? It's great to see DC having so many shows on the air as well. It's just a fantastic opportunity for NBC, I think, on a Friday night, to have this genre. We follow Grimm, and I think that that's a fantastic thing for fans of this genre. They can really get a kick out of that."